With its aquamarine waters, white-sand beaches, abundant marine life and tropical climate, Okinawa is attracting an ever-growing population of holiday-makers – not just from the rest of Japan but from all over the world. Since I last visited Okinawa more than 20 years ago, the number of tourists visiting Japan’s southernmost prefecture has more than doubled from 4.5m in 2000 to 9.58m in the year to March, 2017, when Okinawa surpassed Hawaii, which drew 9.3m visitors last year. 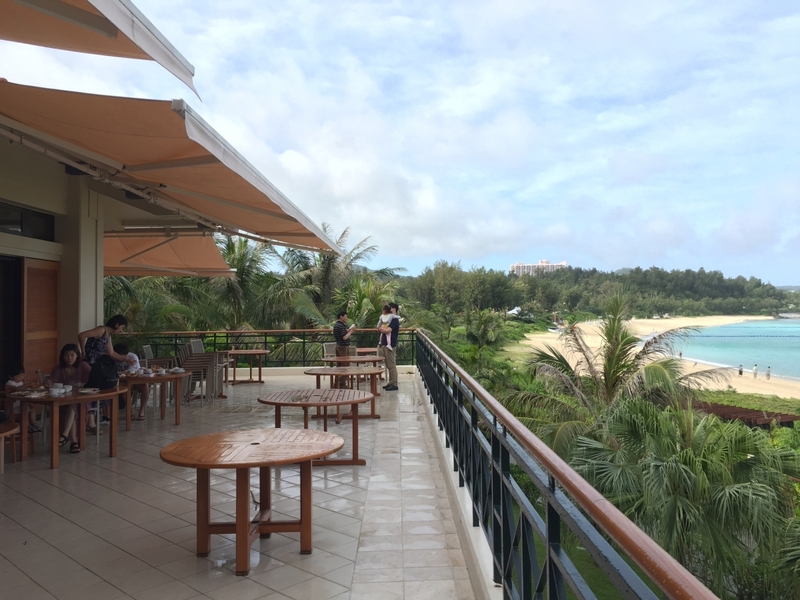 Luxury hotels – including top-end establishments, such as the Ritz-Carlton and Hoshinoya on Taketomi Island – have sprung up throughout the prefecture in recent years, helping to attract seasoned jet-setters in addition to the dedicated scuba divers who have been coming to Okinawa for decades, attracted to its diverse marine life and precious coral reefs. The white sands and turquoise waters of Okinawa’s beaches sparkle under the bright tropical sun. 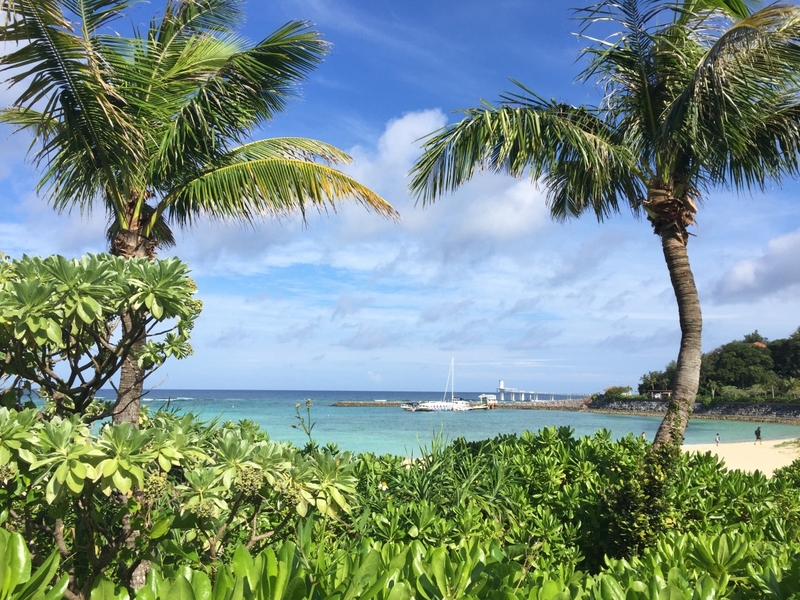 Although I remembered the magic of its crystal clear blue waters and wide skies from previous visits, the islands were never my first choice for a beach holiday, primarily because of the risk of typhoons. Reports of major typhoons lashing the islands have been a staple of summer news in Japan for as long as I can remember and this year was no exception. 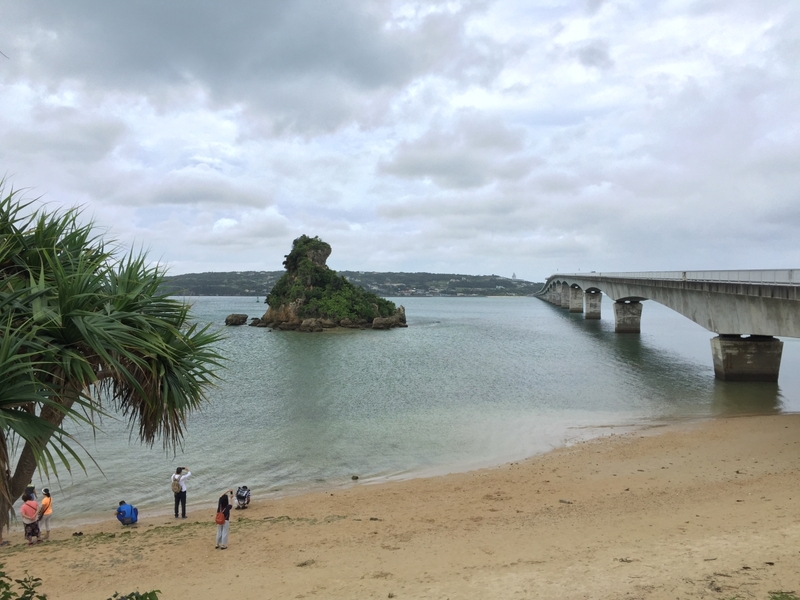 Confirming my fears, our visit to Okinawa’s main island, known as “honto” – one of 160 islands that make up the prefecture – coincided with one of the biggest typhoons ever to hit the region. 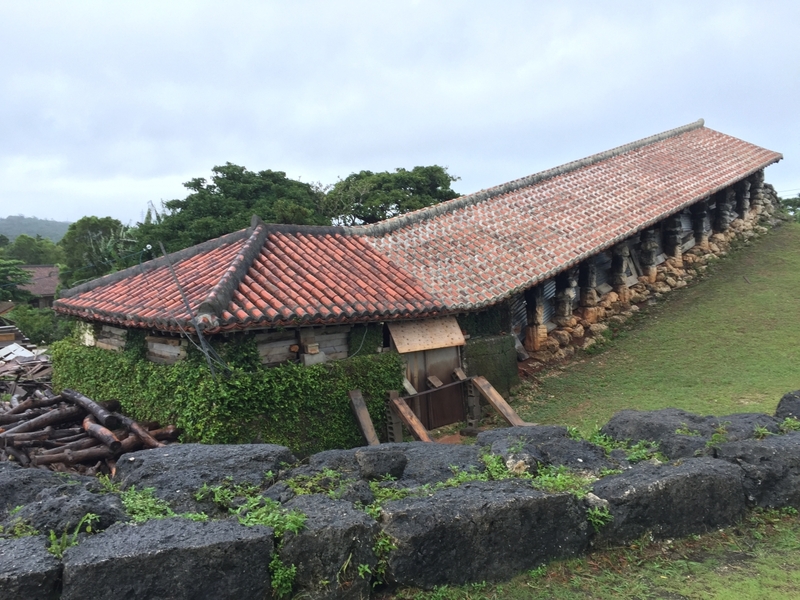 It was early July, a time when Okinawa’s rainy season should have subsided and the heavy rains and winds of its typhoon season, which typically starts in August, should still have been some time away – or so we believed. 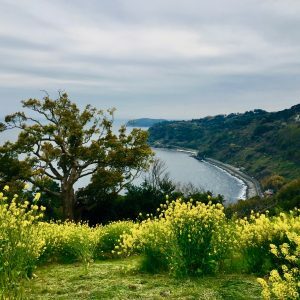 But we landed in Naha, the prefectural capital, in the midst of a storm, which featured grey skies, sporadic torrents of rain and a generally gloomy atmosphere – a far cry from the tropical paradise we had been dreaming of. Ominous clouds greet holiday-makers in typhoon-prone Okinawa. Since a siesta on the beach was out of the question, we decided to visit a pottery village on our way to the hotel. 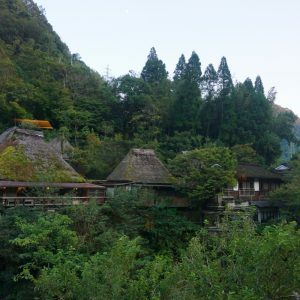 Luckily, Yomitan Pottery Village was conveniently located en route to our hotel, The Busena Terrace, which is situated on the western coast of “honto” about 90-minutes from Naha airport by car. We were happy to leave the concrete jungle of Naha behind but surprised to find the road to Yomitan lined with many poorly maintained houses and run-down commercial sites — a far cry from popular images of Okinawa as tropical paradise. Along the way we passed an extensive area fenced off from the road, which turned out to be Kadena Air Base, one of 32 US military bases on the islands. In Okinawa, it is hard to escape the reality that almost 70 per cent of the 50,000 or so US military personnel in Japan are stationed there, even though the prefecture comprises just 0.6 per cent of Japan’s land area. Yomitan, a pottery village where more than 45 ceramic artists work and exhibit their wares, lies just north of Kadena in a secluded area full of tropical greenery and single-story workshops. A typical climbing kiln in Yomitan Village. Okinawa pottery is characterized by sturdy construction, bold designs in ultramarine, turquoise and amber, and simple motifs, particularly fish. The wares tend to be heavy, which to my mind, makes them impractical as daily-use crockery. Even so, the village makes an interesting stop on the 90-minute journey from the airport to the west coast. 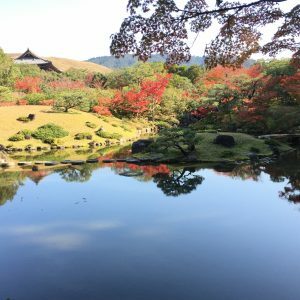 From Yomitan, it was a quick drive to The Busena Terrace, where we found the lobby overflowing with guests – mostly young families – who had taken refuge from the turbulent weather outside. 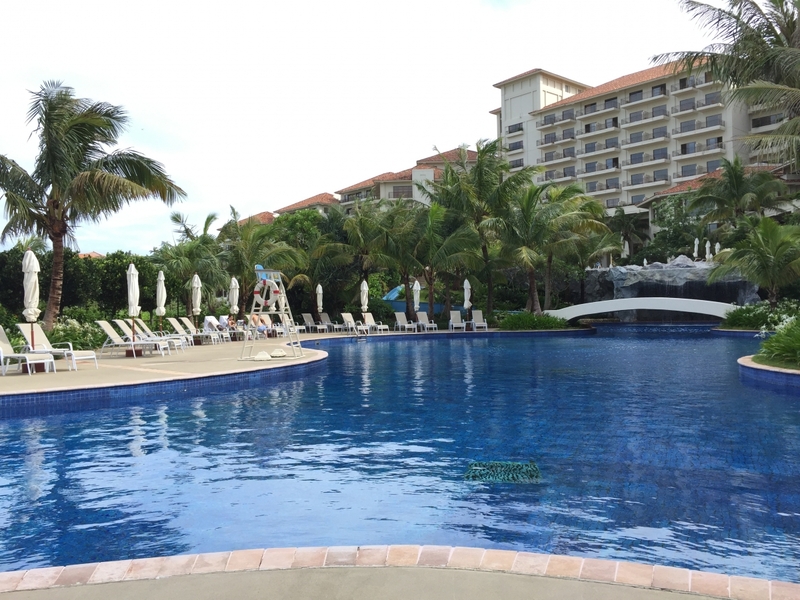 The Busena Terrace, which is part of a large resort complex, has a tropical vibe to it, with brightly colored hibiscus and bird-of-paradise blooming among the palm trees. The resort includes several restaurants, two large outdoor pools, an indoor pool, a thalassotherapy spa and a private beach. The view from one of the restaurants at The Busena Terrace. Rain kept swimmers out of the pool at The Busena Terrace. 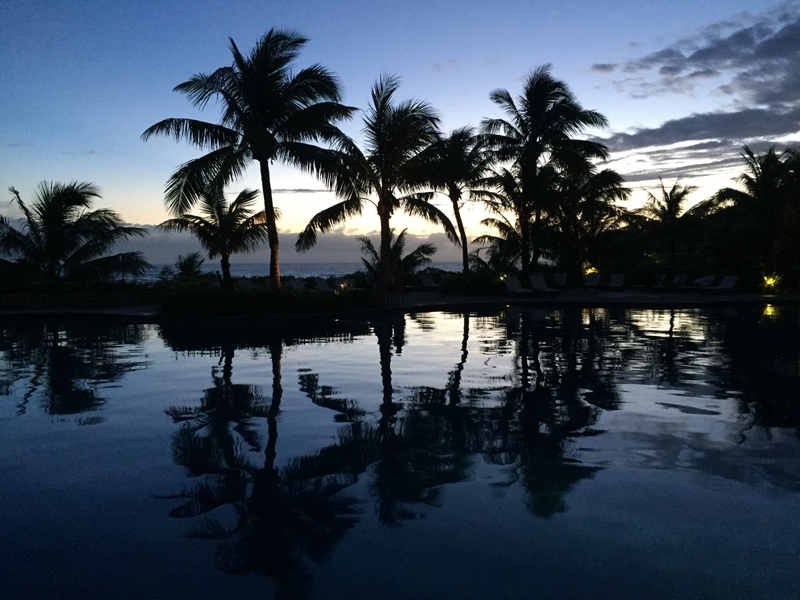 Sunset as seen from the poolside at the hotel. The next morning we woke to the sound of heavy rain. Since the forecast was for similarly stormy weather that day we headed to the Okinawa Churaumi Aquarium, an hour’s drive from the hotel. The Churaumi Aquarium is one of the largest in the world and deservedly famous for its diverse marine life. The aquarium prides itself on its success in raising a number of whale sharks in captivity, some as long as 8.7 meters. The main tank, where three whale sharks live happily with manta rays and other colorful and characterful creatures of the sea, is a massive 8.2 meters in height. 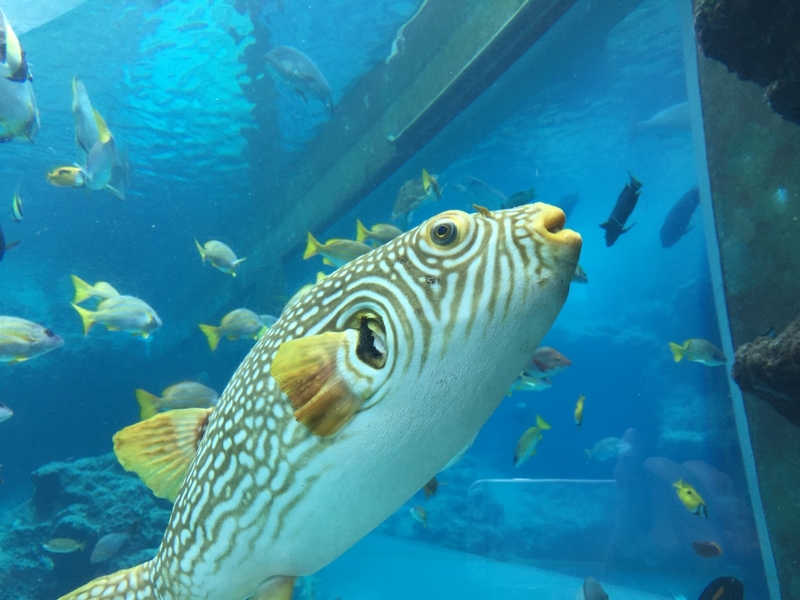 A comical fish entertains visitors at the Churaumi Aquarium. Fortunately, the weather had improved significantly by the third day of our visit, enabling us at last to enjoy the pristine beach in front of the hotel. 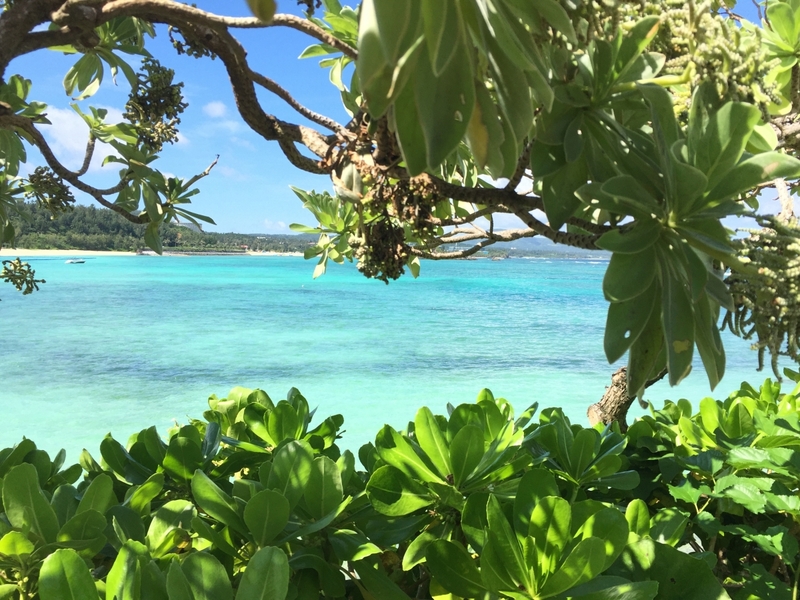 Even though we knew in our minds how beautiful Okinawa’s beaches were, the mesmerizing blue-green colors of the ocean, the clearness of the sky and the sparkling sunlight that danced on the waters that morning still managed to take our breath away. 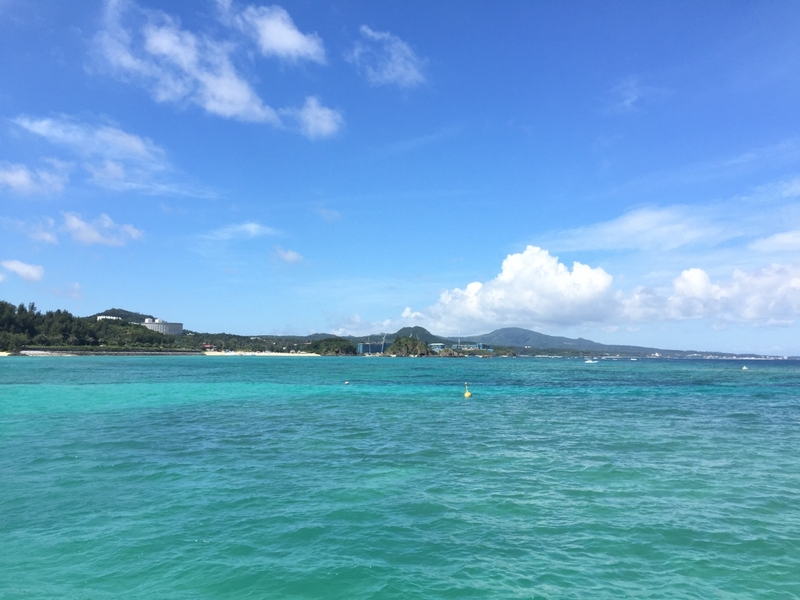 The sea around Okinawa dazzles with its many shades of blue and green. Tropical plants frame a view of the beach along a walkway to the hotel’s jetty. 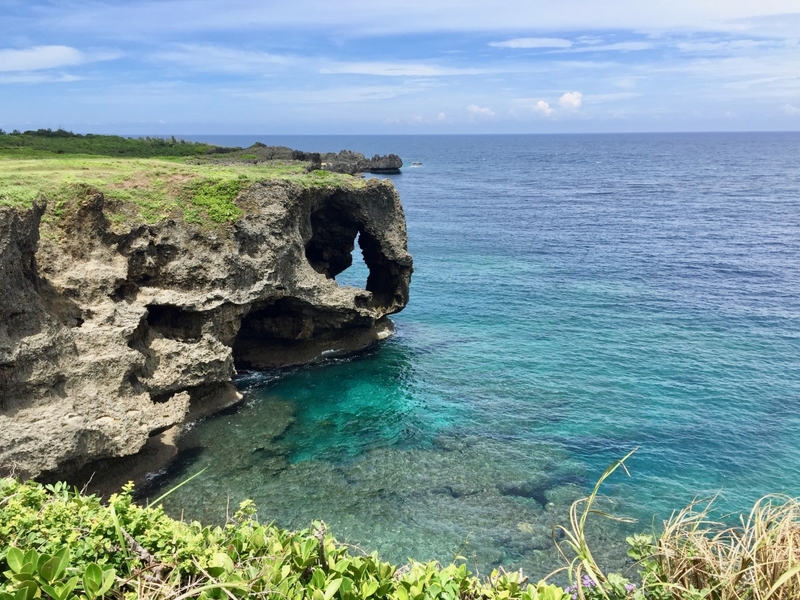 On our last full day in Okinawa, we left the hotel behind and drove south to Naha, stopping at Manzamo to admire the view of the coral cliffs. There is an easy walkway in Onna village that offers views of the spectacular Manzamo coral cliffs. Adan (or pandan), a tropical fruit which grows on trees, can be spotted here and there in Okinawa. 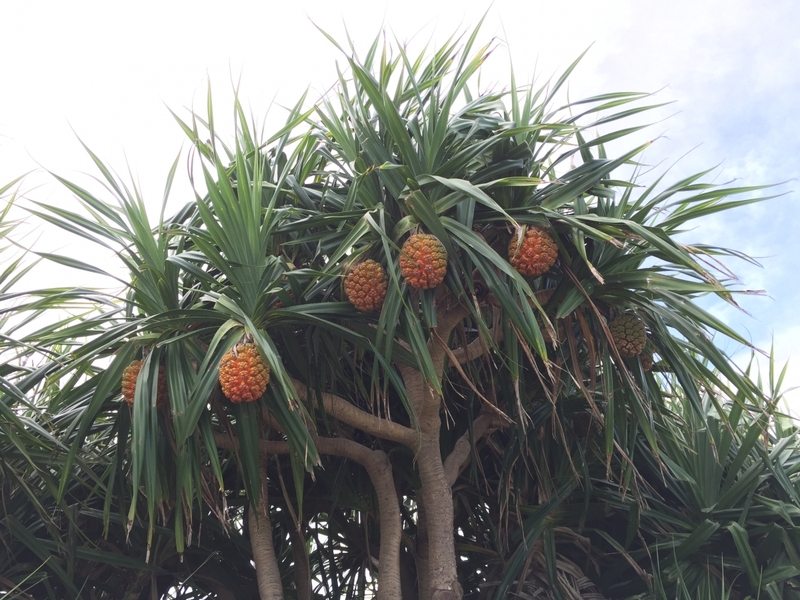 They are often mistaken for pineapples but have an unpleasant taste. Although we did not have time to explore Okinawa’s main city, we did enjoy dinner at Tantei, a low-key, somewhat rundown eatery in a nondescript part of the city which serves authentic, and surprisingly tasty, local cuisine. 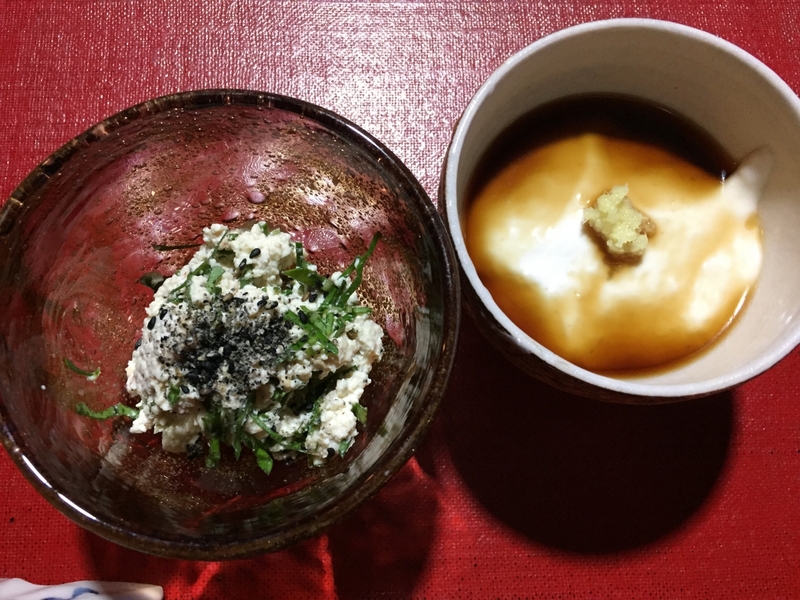 Okinawa, which used to be a part of the Ryukyu Kingdom, an independent state that was invaded by Japan in the early 17th century, has a distinctive cuisine, recognizably different from that of the rest of Japan. Ingredients that feature prominently in Okinawan cooking, such as peanuts, goya, a kind of bitter gourd, goat meat and various body parts of pigs, are not commonly used in dishes elsewhere in Japan. I had booked Tantei on the mistaken assumption that it was the main restaurant of an outlet in Tokyo with the same name, which serves Okinawan kaisei (a form of Japanese multi-course formal cuisine) and which I had enjoyed visiting several years ago. The proprietor of Tantei in Naha told us he had been approached by the owners of the Tokyo restaurant about a joint venture, but had ended up only selling the rights to use the name. “They brought in a chef from Kyoto so the food served there is nothing like what we serve here,” he said. His words made my heart sink, but I had no need to worry. Tantei’s dishes were all unexpectedly delicious eye-openers, with many of the vegetables completely new to us. 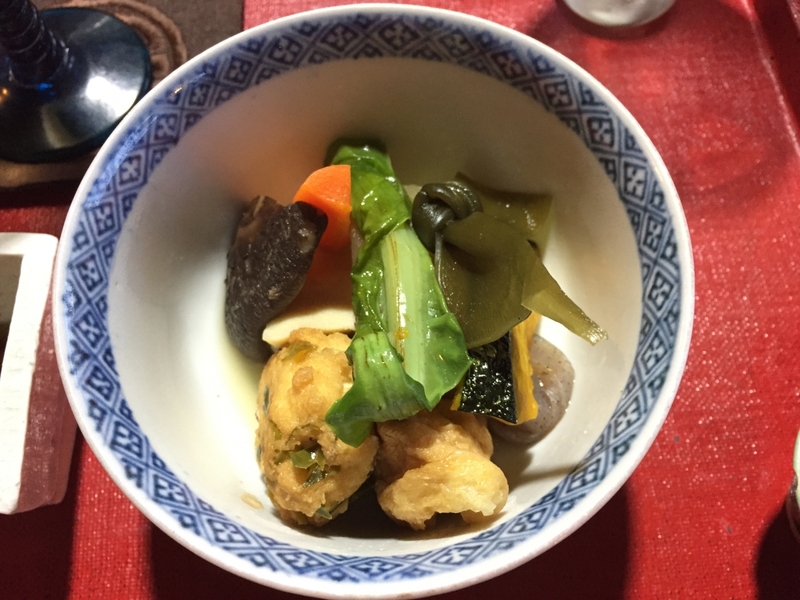 An assortment of vegetables, konbu and fried tofu cooked in a broth. Jimami-dofu (peanut tofu), an Okinawa specialty, with ginger on the right and nigaina, a local, bitter vegetable mixed with tofu and seasoned with sesame on the left. The nigaina has a somewhat sharp taste but is not as bitter as its name suggests. 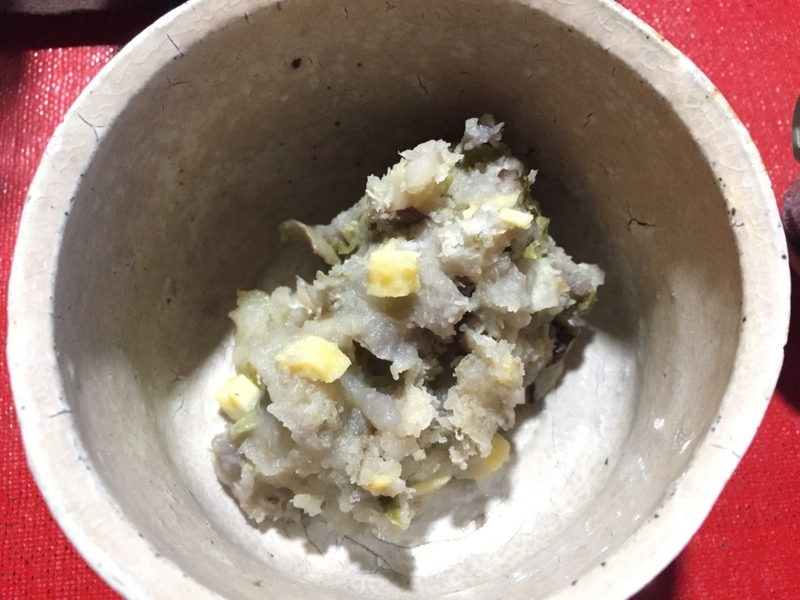 This dish was described as “a potato from the field” mashed with bits of fish cake. The potato had the taste and texture of yam. An assortment of pickles – the green leaf is choumeisou, an herbal plant that grows in Okinawa and underneath it are daikon marinated in shiso and soya sauce. 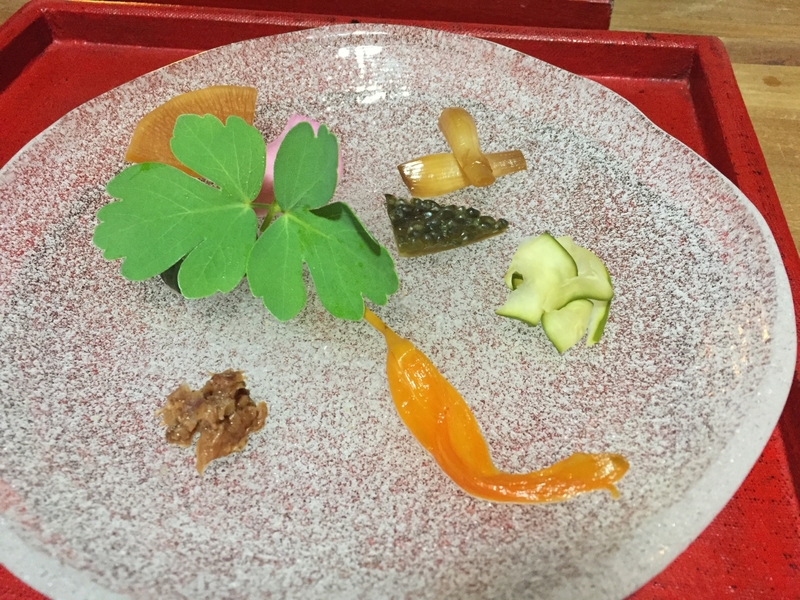 To the right is a small piece of goya, or bitter gourd, Okinawa rakkyo (pickled Japanese scallion), sliced cucumbers, kanzou, an herb, and katsuobushi (shaved dried bonito) with pickled plum. One disappointment was that Tantei did not serve any alcoholic drinks apart from the local, rather bland beer and awamori, a highly potent local drink made from distilling long-grain rice. We flew out of Naha the next day as another typhoon approached, feeling sorry for arriving holiday-makers and grateful that we had been able to enjoy at least a few days of this southern paradise.